“There is a lot in life we cannot control–a cancer diagnosis, the choices our children make, a spouse who leaves, disappointments in our career, a broken heart. But in those tragedies, big and small, we still have a choice: Lie down and give in or stand up and fight. As the back of the books says, there are a lot of things that come our way that we cannot control. It’s not about what comes at us, it’s about how we meet those challenges – victor or victim. In this book, Warrior Chicks, the author Holly Wagner shares her own story, including her battle with breast cancer, of how you can be an overcomer and not overcome. This book is filled with practical and powerful and will encourage you to engage in your life. 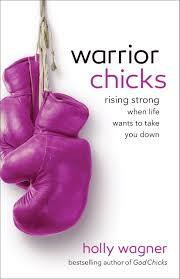 This is an inspiring book to be read and shared with the women in your life that are in the midst of their battle. Show them how to be a survivor warrior.